Stars in My Crown (1950) is Joe David Brown's adaptation of his 1947 episodic novel featuring stories which previously appeared in The Saturday Evening Post. The screenplay is by Margaret Fitts whose other scripts include The Sun Comes Up, Talk About a Stranger and the adaptation of her own novel The King and Four Queens. Stars in My Crown is a nostalgic story where a man recalls his youth and the importance of his mentor, Parson Josiah Gray. In the novel, the parson is the grandfather. In the film, Parson Gray played by Joel McCrea is the adopted uncle of the orphaned John Kenyon played by Dean Stockwell. Ellen Drew is the youngster's loving Aunt Harriet. The tone for the film directed by Jacques Tourneur (I Walked With A Zombie, Cat People, Canyon Passage, Nightfall, etc.) is set right from the top as an unseen congregation sings the parson's favourite hymn, Stars in My Crown. Will there be any stars in my crown . . .
"Do you hear that? You might say I was raised on that song. It takes me back - back to the old times when I was young - back to Walesburg. According to the words of the song we're promised a City of Gold in the hereafter. I used to think that was a long time to have to wait, but I know now that there is a City of Gold right here on earth for every one of us. The city of our youth. Walesburg is only one name for it that's all. Walesburg not as it is now but as it used to be. I just have to shut my eyes and I'm there. Nothing's changed. I'm always a boy in Walesburg. There at my side, as he'll always be, is the parson, Parson Gray." We meet the people of Walesburg and follow their stories as John recalls them with both the clear eyes of uncensored youth and the nostalgic glow for a time past. 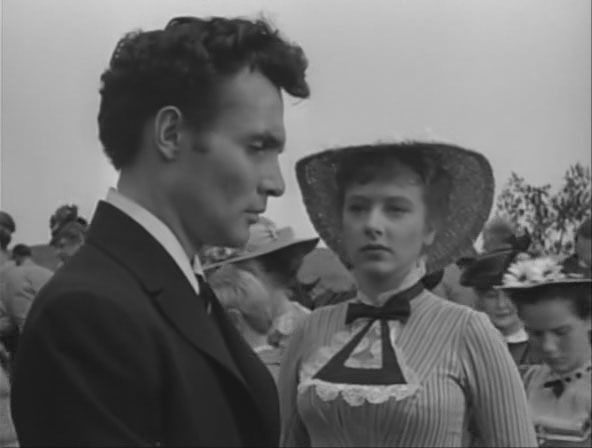 We meet the sweet and pretty schoolteacher, Miss Samuels played by Amanda Blake and her beau, the opinionated young doctor played by James Mitchell. There is Juano Hernandez's Uncle Famous who dispenses understanding and fishing tips to growing boys. Charles Kemper's Professor Jones the traveling medicine show man. The parson's best friend farmer Jed Isbell played by Alan Hale and his five tow-headed sons. There's the town's ruthless businessman Lon Backett played by Ed Begley. Arthur Hunnicut as the town character Chloroform Wiggins and Jack Lambert as the town bully Perry Lockey. Their stories play out through greed and illness, through acts of kindness and acts of courage. The young Dr. Harris has inherited his position in town sadly from the passing of his father. The senior Dr. Harris had the confidence and love of Walesburg. The junior Dr. Harris has, in the words of his father, played by Lewis Stone, "A lot of education, but very little sense." Conflict and heartbreak will be his maturing with the help of Parson Gray. Dr. Harris Jr.: "As long as I am doctor in this town you will oblige me by asking my permission before you interfere with my patients." Parson Gray: "I came out here tonight because I was sent for, same as you. We'll be meeting like this right along now and you may as well get used to it. Souls don't always enjoy perfect health you know - any more than bodies do." Dr. Harris Jr.: "Well, I'm not interested in souls, Mr. Gray. And when I want a sermon on the subject I'll come to church for it." Parson Gray: "Good. I'll be glad to preach you one." The stories of Stars in My Crown are played out at a gentle pace befitting the backwards view. When silence is all that is necessary, as at the side of a sick bed, we see the experience in silence. When dialogue is necessary, it is amusing, as when the parson diffuses a difficult situation with a humourous anecdote. It may be revealing as in the relationships between the parson and his friend Jed, or between the parson and his devoted, plain speaking wife. There are wonderful scenes between the young John and his friend Chase Isbell played by Norman Ollestad (Sky King) as they philosophize as only the young may. One scene features the lads riding a hay wagon with the sunlight dappled through the treetops. The black and white cinematography by Charles Schoenbaum gives you the feel of the warmth of the sun and the scratchiness of the hay. In both the novel and the movie, one of the most moving scenes and challenges to Parson Gray is dealing with the ambitions of Lon Backett to force Uncle Famous from his land over mining rights. 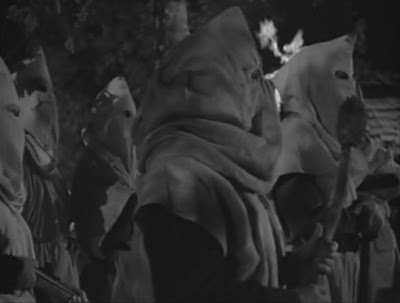 The Klan is organized to frighten the old man and when that doesn't work, murder is in their hearts threatening the very soul of Walesburg. Parson Gray will not use guns and will not accept help as he faces the evil. The first time I read the book, I was reading that section in public and could not hold back my tears. Parson Gray: "Night Riders. Yellowbacks in fancy dress! You shame me and you shame the Lord that made you and called you men. And if I wasn't His servant I'd take a buggy whip to the lot of you." When Stars in My Crown ends, it ends much too abruptly for my liking although all of the stories that wanted telling have been told. Perhaps, like John Kenyon, I want to spend a longer time in Walesburg. There is not a false moment in any of the performances and the people and emotions are genuine. 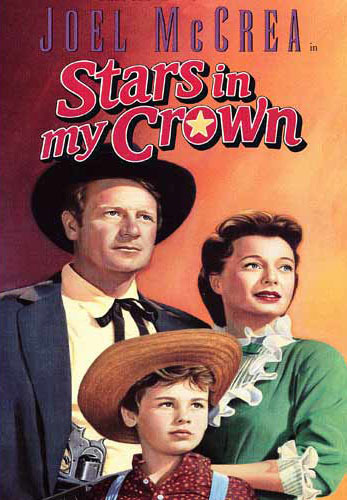 Joel McCrea often cited Stars in My Crown as a favourite among his films and director Jacques Tourneur so loved the story that he offered to work on the film for scale, which may have tarnished his reputation among studio executives. Nonetheless, he left us a true classic film. I can't help but wonder if during the filming second lead Amanda Blake took any notice of a gangly young man with an engaging smile who was the tallest of Alan Hale's brood. Could she possibly have imagined that inside of a decade she and James Arness would make television history as 19 year co-stars as Kitty Russell and Matt Dillon? Before any regular visitors to this blog ask, the answer is yes. All roads lead to Gunsmoke. TCM is screening Stars in My Crown on Wednesday, May 16th at 12:45 AM. I hope they will pardon my saying that I believe the movie deserved a prime time spot during Joel McCrea month. Wish I could comment on STARS IN MY CROWN, but I always seem to miss the beginning! Judging from the last half, it's one fine movie. Great choice, CW, and very informative post! My Mom was a Joel McCrea fan and especially enjoyed this one. "All roads lead to Gunsmoke." Love this. It's been some years since I've seen this movie, so your tantalizing hint at the future partnership between Amanda Blake and James Arness took me by surprise. Got to watch this one. Your recommendations are never wrong. Thank you very much, Lee. I should be able to get to my recipient responsibilities in the next little while. I hope you can catch the beginning of the movie sometime. Thanks, Rick. 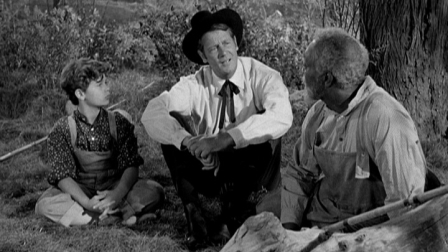 I am of the opinion that the best moms love Joel McCrea. At least that's what I tell my kids. JTL, it's the sort of movie that wears very well and is an obvious labour of love. If you're a night owl you'll want to catch this one, Kim. If you're not, consider recording for a rainy day. It's been years since I've seen, but I remember loving and am really looking forward to seeing it again. Ah Kevin, it is indeed a movie to love and we're lucky TCM is including it in their schedule. Richard Kiley - Man of ... Gunsmoke?